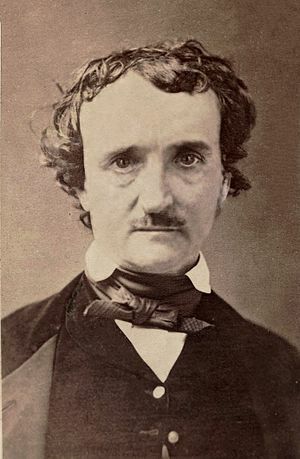 The first author I can ever remember labeling as “one of my favorite authors” was Edgar Allan Poe. I had an enthusiastic 7th grade teacher that loved his worked and her love for him rubbed off on me and as a result I devoured his writings. It also didn’t hurt that one of my favorite film actors at the time was the delightfully macabre Vincent Price. I had three favorites among Mr. Price’s numerous film and television credits, House of Wax (1953), House of Usher (1960) and The Pit and the Pendulum (1961), two of which were Poe stories adapted for the screen. They were so frightening that I can remember having to cover my eyes with my hands and peak through my fingers, while curled up in a ball on my living room sofa….and this was on a sunny Saturday afternoon! While I read his stories and poems when I was younger, I didn’t learn too much about Poe himself until I was much older. His life was so sad and his death was fittingly mysterious and it breaks my heart that he only attained success after his life had ended. Today you can find Poe’s work and influence everywhere. His detective C. Auguste Dupin, from “The Murders in the Rue Morgue”, inspired future fictional detectives including a pretty famous one, Mr. Sherlock Holmes. Poe is also credited with single-handedly inventing the genres of Science Fiction, Fantasy and Mystery! So today I think I will reread a few of his short stories and poems to celebrate his birthday, which luckily for all of us are available online in e-book form for free! Check out either Amazon or Project Gutenberg for a free download. And if you liked to read a great fictionalized book about Mr. Poe may I recommend “The Pale Blue Eye” by Louis Bayard. From some previous posts you know that I love old Hollywood, the fashions, the stars and of course the films. One of my favorite MGM film stars from the 40’s and 50’s is the beautiful and athletic Esther Williams. Even though I can not swim a stroke, I loved watching those gorgeous women swim in unison in those dazzling costumes in beautiful Technicolor! She might not have been the best actress in the world, but that was neither here not there, what really mattered were those big production numbers in the pool! Today when I was searching for information on the Olympic synchronized swimming results, I came across this story from ABC news about a group of modern Hollywood women, The Aqualillies, that are keeping Esther’s film legacy alive with their pool performances. It’s great to see that old Hollywood Glam is still alive and kicking (so to speak)!